Photos and story by Franklin Wilson in the Bahamas with the compliments of Ringbang, Crown Mining Supplies, Fazia’s Collection, Fitness Express, German’s Restaurant and Rose Hall Town Youth and Sports Club. 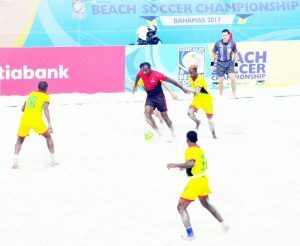 Antigua and Barbuda prevailed against Guyana 8-6 in a fourteen goal thriller in their 11th place clash at the CONCACAF Beach Soccer Championship which ended last evening at the BFA Soccer Stadium at Malcolm Park here in Nassau Bahamas. Action in the Guyana vs Antigua & Barbuda match yesterday afternoon at the BFA Soccer Stadium at Malcolm Park, Nassau, Bahamas. Lifting the championship trophy was Panama which defeated defending champions Mexico 4-2 in an exciting final; the champions were led by a double from Justo Arrocha and one each from Alfonso Maquensi and Rafael Garcia. Both Panama and Mexico qualified for the FIFA Beach Soccer World Cup set for April 27 – May 7, 2017 at the same venue in the CONCACAF 16 team championships having emerged as the top two teams from the CONCACAF Beach Soccer Championship. They would be joined by host nation Bahamas as the confederation’s representatives. Not intimidated by the fact that Guyana defeated them in their earlier meeting in this same championship 6-4, the Antiguans came out with a robust style of play which eventually delivered a memorable win for them and 11th place ranking of the 16 competing teams, Guyana having to settle for 12th. Guyana opted to start with Captain Deshawn Joseph, Jermaine Grandison, Jamal Haynes, Michael Wilson and the ever reliable Ethan Sparman in goal. An Early free kick within close range was won by Guyana after Haynes was fouled but he sent the ball way into the stands. Immediately after, Antigua and Barbuda took the lead with a cracking header from the half way mark off the head of Kevin Richards that beat Sparman with the game not yet one minute old. The Antiguans came with a plan to take the attack to the Guyanese who had also defeated them at the Barbados Festival a few weeks ago. Despite giving up the lead the Guyanese were the most aggressive of the teams creating multiple scoring chances but were not clinical with their finishing, going over the bar from close range as the shots lacked direction. In the 9th minute, Antigua won a free kick from in their half, the ensuing shot crept along the sand and bounced awkwardly for Sparman who did not take cleanly, the loose ball was pounced upon by Elvis Thomas who scored his nation’s second goal, Antigua 2 Guyana 0 at the end of the first period. The same five started for Guyana in the second period with the aim of making amends for the first period. Antigua played a more robust game as they tried to bully the smaller Guyanese lads. Wilson was fouled half way into the Antigua half and he himself took the shot to deliver Guyana’s first goal in the 13th minute. But one minute later, Antigua restored the two goal advantage when Omarie Daniel found the back of the nets for his side’s third goal. Antigua’s fourth goal unfortunately came off the head of Guyana’s Wilson from a goal mouth scrimmage in the 15th minute; Antigua 4 Guyana 1. The Golden Jaguars of the beach continued to create opportunities but their shots continued to be all over the place and not on target. Captain Joseph, who played mostly in defence, decided to come forward in the 20th minute and he scored Guyana’s second of the match. But in the 21st minute, Antigua’s Captain Desmond Bleau took on a free kick after a Guyanese infringement. His shot from the half way mark was again not taken cleanly by Sparman with the rebound falling into the path of the onrushing Thomas who hammered home for his second goal and Antigua’s 5th of the match. Bahamas’ Lesly St Fleur (#10) scores the first goal against the USA and his 11th of the championship. But one minute later Jamal Haynes made it three for Guyana with a well taken free kick half way in the opponents half as the game continued at a fast pace. The penultimate period ended with Antigua still enjoying a two goal advantage 5-3 as they did at the end of the first period. Early in the final period (11’ 20″) Captain Joseph and Haynes teamed up to deliver Guyana’s 4th goal with a powerful shot by Haynes in the 25th minute, the lead now narrowed to a single goal. Captain Joseph finally found his usual energy in the final period and fired in the equalising goal with 9’ 15″ to game time to the applause of the Guyanese supporters in the stands; Antigua 5 Guyana 5 and all to play for. With 5’ 11″ to game time, poor work at the back between Sparman and Grandison allowed Daniel his second goal and number 6 for Antigua to take the lead again. Bad work again from Guyana with 3’ 37″ resulted in Jahshawn Moore rocking the nets against his teammate Sparman for Antigua’s 7th goal to the disappointment of his fellow teammates and supporters. Wilson pulled one back for Guyana with 2’ 25″ to go on the end of a free kick taken by Grandison and an assist from Moore. Guyana 6, Antigua 7. But Antigua determined to take the win and 11th place again restored their two goal advantage with a well taken shot from Omarie Daniel that beat Sparman way out, it was Antigua’s 8th goal with 54.8″ to the final whistle and Daniel’s hat-trick – and that’s how it ended despite a valiant effort from Guyana. El Salvador took the 3rd place following a comfortable 7-2 win over Guadeloupe. The first quarter ended with the score tied at 2-2. El Salvador took the lead in the second quarter on a Jose Ruben Batres goal in the 17th minute and never looked back as the lead stood for the remainder of the half. Batres slammed in two more goals in the final period to complete his hat-trick, while there were also goals from Darwin Ramirez and Rafael Rizo to seal El Salvador’s win and the third place. 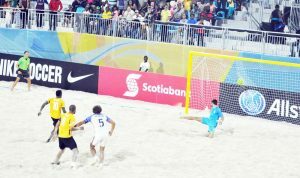 The 5th place playoff between the host nation, Bahamas which has already qualified for the FIFA Beach Soccer World Cup as hosts and the USA saw the visitors taking command from the first whistle and pulled away 2-0 leaders by the end of the first period. The quickness on and off the ball by the Americans was too much for the Bahamians to handle initially but they composed themselves and fought back gallantly from the second period onwards. The home team had a great opportunity to halve the lead with 4 minutes to the end of the second period but their most exciting player and leading goal scorer Lesly St Fleur sent the ball over the cross bar of an open goal. St. Fleur had the opportunity to make amends when USA’s Lewie Valentine deliberately handled the ball in the area. St. Fleur’s run up was from beyond the half way mark and his powerful shot whistled past goalie Christopher Toth with 19.3 seconds to the end of the period two to halve the USA’s advantage going into the final period. It was the Bahamian’s 11th goal of the championship. Not so elegant work at the back by the Bahamas gifted USA their third goal off the feet of Nicolas Perera with 10’ 20 to go in the game but a perfect response came from Bahamas’ Captain Gavin Christie when the ball restated with the game clock reading 10’ 17″ triggering a rapturous response from the packed stadium; USA 2 Bahamas 2. 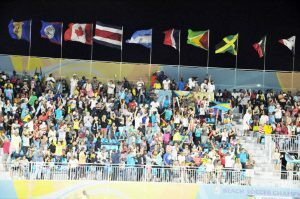 Part of the crowd at the packed BFA Soccer Stadium at Malcolm Park in Nassau, Bahamas last night. But the Americans went on to score two more goals to win the match 4-2 but not without a good fight from the Bahamas which ended as the best Caribbean team, 6th place, in the championships. In the 7th place playoff, it was Soca versus Reggae with Trinidad and Tobago’s Soca Warriors taking on Jamaica’s Reggae Boyz. By the end of the first quarter the Soca boys were ahead by the lone goal of the match at that point. The second period saw both teams opening up as they played to the blurring rhythms of reggae and soca as the many numbers were played, goals also reigned, a total of seven scored in the period, Jamaica 3 and T&T 4, the Trinis still holding on to the lead 5-3. Despite the fierce rivalry on the pitch, the players from both sides also displayed a high level of sportsmanship and at the end showed appreciation for the fans collectively as they complimented each other, even sand bathing each other. In the 9th place playoff, Canada battled back from behind to level against Costa Rica when full time expired with the score locked at 5-5. Seconds into the three minutes of extra time Costa Rica nosed ahead to take a 6-5 lead and defended well to win the match in exciting fashion. Belize ended as the 13th placed team after hammering the Turks and Caicos Islands 9-4, a result that was never in doubt. Despite the heavy loss, the young Turks and Caicos side with an average age of 19, ended their first outing at this level, rated as the 14th placed team out of 16. In the battle for the 15th position, Barbados clawed their back from a one goal deficit against the United States Virgin Islands in the first third to lead 2-1 when the second third was concluded. With all to play for in the final third, Barbados fought to stave off the USVI team and as the minutes ticked away, the USVI was awarded a penalty with 4’ 21″ to game time but they missed a chance to tie the game. Seconds later, the Bajans increased the lead to 3-1 (4’ 03) which turned out to be the final score which earned Barbados the 15th place overall as the USVI ended 16th. Jamal Haynes of Guyana won the young player of the tournament award.